We’ve had our eye out for all of these and we solved out seating problem by finding a late 1800’s/early 1900’s era ball & claw piano stool at one of our favorite antique stores in Simi Valley. We already figured we’d likely end up with a piano stool because we wanted to be able to push in our seating to keep it out of the way and the leg space beneath the vanity is very small. A piano stool would be one of the few things that would fit the bill. It also had to be functional. The stool would not be just for decoration but for actual everyday use. The stool was in unfortunately bad shape when we took a closer look in it at the shop and the shop owner dropped the price down from $65 to $25. 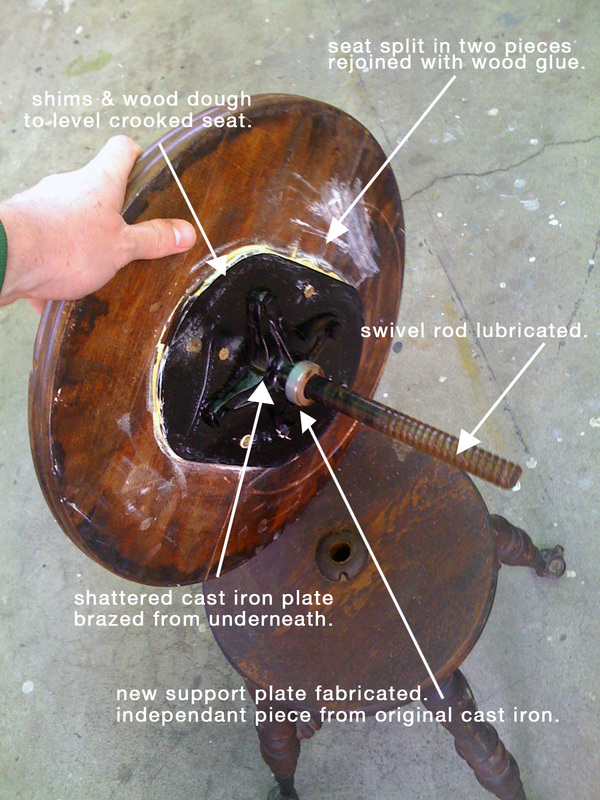 Twenty-five was still a lot for an old stool that we weren’t sure we could fix. The cast iron piece that was holding the seat to the swiveling rod (which didn’t turn) was completely shattered and the seat itself was broken in two pieces. We decided to go for it and I had to enlist my dad’s help to fix it. I didn’t get around to taking a before picture of the crumbled cast iron but here’s all of the problems it had and the solutions that we came up with. 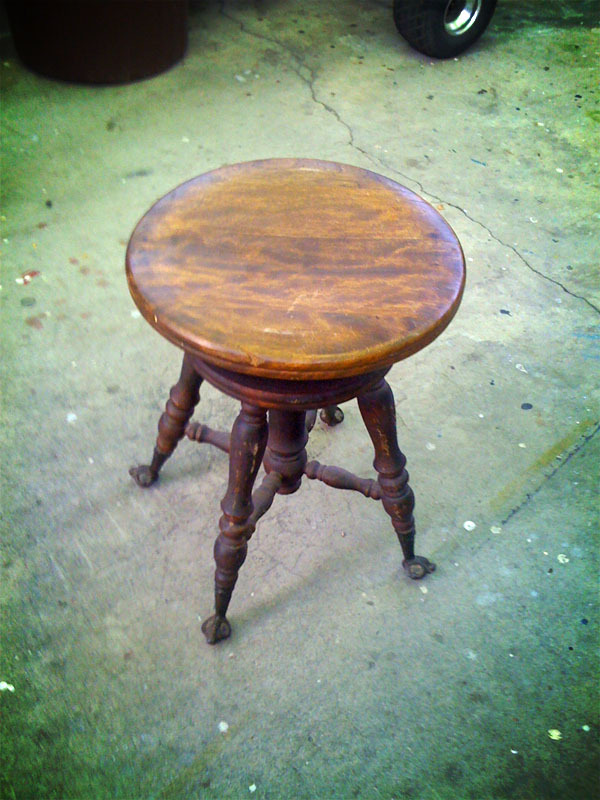 Granted the stool is not all back to it’s original pieces so it’s not a pure restoration. In order to make this seat sturdy enough for daily use we had to add to it somewhat. The X-shaped cast iron piece couldn’t be welded of course so it was brazed from the inside and then a metal plate was made to go in between the wood seat and the piece. The pieces were both painted with a glossy black coat to make the cast iron and the plate look uniform. Putting the seat back it, we discovered it was lopsided so my dad even it out using washers as shims and then put wood dough (which I plan to use a mahogany stain on) in the excess space. Tho’ it’s hard to tell in the photographs, one treatment with Howard’s Feed-n-Wax made a considerable difference in the wood (see the picture on the right). 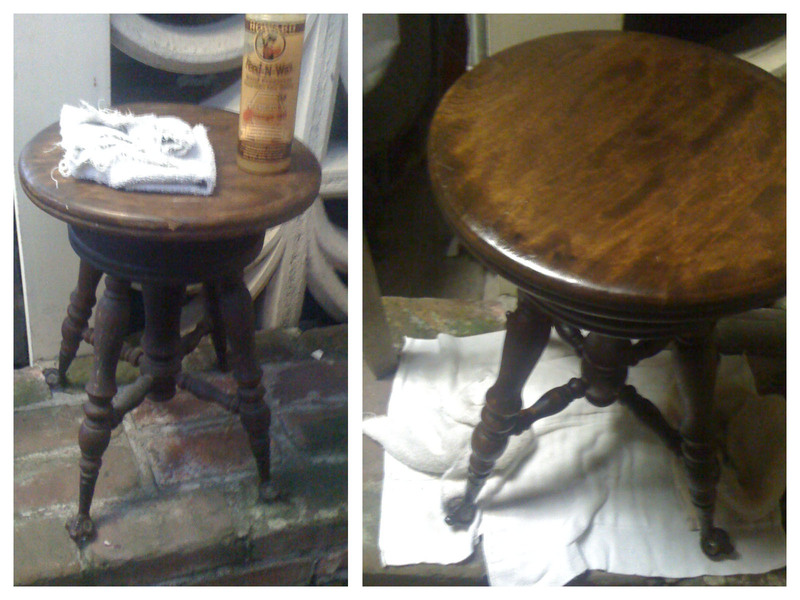 Howard’s is my favorite wood cleaning product I’ve used so far in my venture into restoring/refinishing. It really keeps the wood from drying out, replenishes the moisture, and gives it a nice shine. For best results, leave it on for 20 minutes before wiping off, just as the bottle suggests. So that’s where I am now…in mid-clean. I cleaned the ball & claw feet as best I could but it still needs a great deal of attention. I’m going to need to figure out the best way to properly clean those feet. More pictures to come as the project continues! Not bad for a $25 piece of turn-of-the-century furniture that might’ve been thrown away otherwise!